Have you submitted your abstracts for the 2015 COA & CORS Annual Meeting? Abstract submissions for podium and poster presentations at the 2015 COA and CORS Annual Meeting are being accepted until October 24. Submit your abstract by clicking here. More information can be found about the 2015 Annual Meeting being held in Vancouver from June 17-20 by visiting www.coaannualmeeting.ca. Avez-vous soumis vos précis pour la Réunion annuelle 2015 de l'ACO et de la SROC? On accepte les précis pour la présentation d'exposés et d'affiches à la Réunion annuelle 2015 de l'ACO et de la Société de recherche orthopédique du Canada (SROC) jusqu'au 24 octobre. Pour soumettre un précis, cliquez ici. 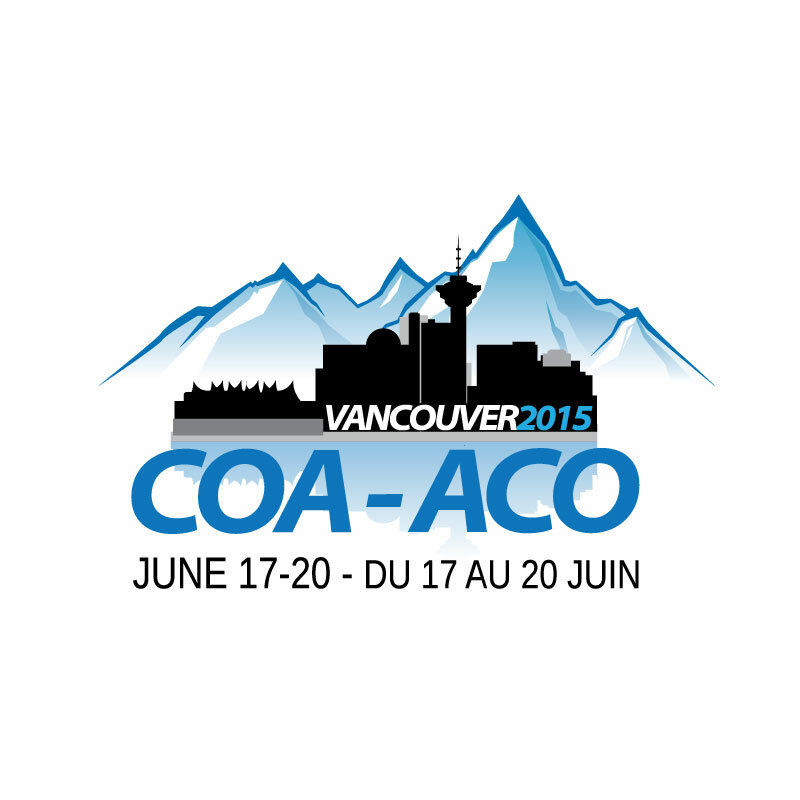 Vous trouverez à www.coaannualmeeting.ca de plus amples renseignements sur la Réunion annuelle 2015, qui aura lieu à Vancouver du 17 au 20 juin. Applications for the North American Travelling Fellowship (NATF) are being accepted until December 30, 2014. This dynamic fellowship is open to surgeons who have completed their residency training in Canada up to three years ago. The tour of Canadian and American centres will begin in the Fall of 2015. We encourage all eligible members to apply. Complete criteria and a downloadable application form can be found at www.coa-aco.org: click on Medical Education in the top menu bar, then click on Travelling Fellowships. Click here to download the application form now! L'ACO accepte les demandes pour la Bourse VNA jusqu'au 30 décembre 2014. Cette bourse stimulante est offerte aux orthopédistes qui ont terminé leur résidence au Canada au cours des trois dernières années. La tournée des centres canadiens et américains participants commencera à l'automne 2015. Nous invitons tous les membres admissibles à faire une demande. Vous trouverez tous les détails et un formulaire à www.coa-aco.org. Cliquez sur « Formation médicale », dans la barre de menu, puis sur « Bourse de voyage ». Cliquez ici pour télécharger le formulaire de demande dès maintenant. Hip implants rely on the normal functioning of bone cells to achieve fixation of the implant with the bone. However, small metal particles released from hip implants, due to friction between the moving surfaces, have been shown to be toxic to the surrounding bone cells. This causes the implant to loosen in the bone and often leads to patients requiring second surgery to replace the failed implant. L'augmentation des dépenses en santé est telle qu'elle compromet l'avenir même du système public et l'équilibre budgétaire des provinces. Et moins un gouvernement provincial respecte ses prévisions de dépenses en santé, plus l'atteinte de ses cibles budgétaires devient difficile. Or, l'expérience des dernières années montre que c'est malheureusement le cas. The federal government says going back to the old system of covering all health care costs for refugee claimants would be too complex and costly. That argument is part of a government appeal of a Federal Court decision from July that ruled the current medical coverage violates the charter. The government also filed a motion to stay the court's judgment. The 2012 changes to the interim federal health program saw the government dramatically scale back how much medical service it would cover for people waiting for refugee claims to be decided. It was a frightening weekend for Garry Lynch and his family when his 91-year-old mother, Catherine Lynch, was forced to wait more than three hours for a Montreal ambulance, after having fallen and been stuck in a bathtub for 13 hours. "It was just a terrible situation," Garry Lynch told Mike Finnerty on CBC's Daybreak Montreal. "At that age there should be some compassion, showing some exception to the rules to send somebody quicker." L'approche centralisatrice de la réforme du ministre Gaétan Barrette « n'est pas la solution », selon Réjean Hébert. L'ancien ministre de la Santé avance que les réformes de structure n'améliorent pas l'accès aux services de santé. Selon lui, replacer l'hôpital comme point d'entrée de tout le système se fait au détriment des services communautaires, qui sont au plus près de la population. This spring, the Canada Health Accord — the 2003 agreement between the federal and provincial and territorial governments on healthcare delivery and funding — expired. Although the current federal government has set out a new funding formula for health transfer payments to provinces, funding will be tied to economic growth and population size without adjustments to account for healthcare inflation. And while there is a position on funding, there has been little apparent movement or discussion about the delivery of healthcare going forward, and that has many wondering what this means to Canadians. A majority of Canadians are concerned over long wait times to see medical specialists, according to a new survey commissioned by the Wait Times Alliance. The poll, conducted by Nanos Research, surveyed 1,000 Canadians. When respondents were asked to list their level of concern for six different wait-time scenarios, 64 per cent reported they were most concerned about the length of time it takes to see a specialist. You're sitting next to your loved one in hospital, holding his or her hand while they rest, but then you're told that visiting hours are up and you need to leave. Canadian health officials know it's distressing. Now, a number of hospitals across the country are getting rid of visiting hours so that patients' family members can stay with them around the clock.